1) 'When the Swallows Fly' was released as a single in the Netherlands in September 1971, the B-side was 'Give Your Best'. The song was recorded on 18 June 1968, and featured on the album 'Idea'. The single peaked at number 20 on the Dutch Singles Chart. 2) 'In the Morning' was released as a single in Japan in November 1971, and peaked at number 36 on the Japanese Singles Chart. The B-side was 'To Love Somebody'. 'In The Morning' was originally recorded in 1965, but re-recorded in 1970 for the soundtrack of the film 'Melody', changing the title to 'Morning of My Life', though credited here with its original title. "Don't Wanna Live Inside Myself" is a ballad written and sung by Barry Gibb, and released on the Bee Gees' album Trafalgar in 1971, and the second single released on the album. This slow dramatic piano ballad was described by Robin Gibb in the liner notes of Tales from the Brothers Gibb box set as "...the dawning, or the closing, of the 'gotta find out who I really am' era." This track was the last song recorded for the album. "Don't Wanna Live Inside Myself" was recorded on April 7, the same day when they finished the tracks "Israel", "It's Just the Way" and "Engines, Aeroplanes". The single was released in November 1971, four months after the number 1 smash hit "How Can You Mend a Broken Heart" Considering that "How Can You Mend a Broken Heart" was a number 1, it was surprising that this did not even make the top fifty. With the success of "...Broken Heart", Atco Records was choosing ballads exclusively for Bee Gees singles during this time. This song along with "Walking Back to Waterloo" was released as a double A in Spain, Canada, Japan and in the US. The album version of the song was faded at 5:24. A promo single issued by Atco in the US, featured the song in its mono and stereo versions on its respective sides. Could easily have been a world released single,just a fantastic song in all ways. For whatever reason, I really, really hate Trafalgar (love all their other albums around this time) and I really, really, really hate How Can You Mend a Broken Heart. So I should hate Don't Wanna Live Inside Myself I suppose....but nope, it's one of the most gorgeous songs I've ever heard. Not sure it works as a single necessarily, but as a song it's stunning. Not terribly fond of Don`t Wanna Live Inside Myself. It is an okay tune but kind of plods along with no real Bee Gees sound. The sides should have been flipped as Walking Back To Waterloo is one of the best songs they ever recorded. The alternate Robin and Barry leads as well as the sweeping chorus. It would have easily made #1 as a follow up to Broken Heart IMO. "In the Morning" is a stunning song. In Australia it was the flip side of Ronnie Burns' single "Exit Stage Right", also written by the Bee Gees. Outsiders may find this rather bizarre, but it was quite comon in those days for one side of a single to be the hit in Melbourne and the other in Sydney, almost as if one city was trying to spite the other. That's what happened in this case. "In the Morning" was the hit side in Sydney. When I first heard it, which I did with difficulty by listening at night on my little transistor radio from Melbourne, I honestly thought it must have been a Bob Lind song. I can't think of any other Bee Gees song that sounds similar to this. I don't like Trafalgar much. I remember liking three or four of the songs, of which "How Can you Mend..." was one, along with "Greatest man In the World" and "Walking Back to Waterloo". I thought the album as a whole was a real let-down after Cucumber Castle. Several of the tracks "plod", to use an expression already used by others in this thread. Sorry guys but Al Green owns "How Can You Mend a Broken Heart". As has been pointed out, this single did nothing in the UK, so Al Green's version was the most familiar one, to this day it is still disconcerting hearing Robin come in instead of Al! Also I love "Trafalgar" (album... and song) and "Don't Wanna Live Inside Myself" which has the delicious image of Barry traipsing around a graveyard like a proto-Goth, though am I right in thinking it's one verse too long? Man at C&A and Grant like this. I suppose an argument could be made that "Don't Want To Live Inside Myself" might've been the inspiration for Dylan's "Knockin' On Heaven's Door" a couple of years later. Same plodding tempo, meter and three chords. I distinctly recall hearing it a few times on KNX FM in Los Angeles, which was the FM adult contemporary station out here at the time. I never heard it played on any top 40 station at all, and understandably so. A-sides simply shouldn't demand this much of an attention span. "Walking Back To Waterloo" is lyrically a rehash of "Turn Of The Century" except this time, they apparently wish to go back even farther in time. Once again, there's that extremely boilerplate descending chromatic bass line. Of course, since this came out at around the exact same time as "Stairway To Heaven," neither act can accuse the other of plagiarism. ^^ I prefer "Knocking on Heaven's Door", both the song and Dylan's rendition of it, and it's not often that I say that kind of thing about anything sung by Dylan. "Don't Wanna Live Inside Myself" was the second of three Atco Bee Gees 45s that I didn't find until later. I'm not sure when I finally obtained it, perhaps in the 1990s again. As with "If Only I Had My Mind on Something Else," I might not have known it was a single until I met my Bee Gees fanatic college roommate in 1978. When I finally heard it, I remembered thinking that it was pretty good, but it seemed to go on and on and on. I wondered if it would ever end! I suspect I first heard it by playing it off the Trafalgar LP, which I found in the cut-out bins in the late 1970s. Maybe if it either had one fewer verse or many fewer repeats of the title line, it would have worked better. As for "Walking Back to Waterloo," this was another B-side I don't remember hearing before I burned my CD-R of Bee Gees A and B sides in the early 2000s. It's marginally better than the A-side, but neither side exactly sounds like a hit. On the front page of its October 16, 1971 edition, Record World listed "Don't Wanna Live Inside Myself" as one of its four Singles of the Week, writing, "Since the group's reformation, every Bee Gees single has shot up to number one and there's no reason to believe their latest, from 'Trafalgar,' won't do as well." Cash Box listed the song third in its October 16 Picks of the Week, ahead of such future smashes as "Theme from Shaft" by Isaac Hayes (listed 5th), "Imagine" by John Lennon (6th), and "You Are Everything" by the Stylistics (7th): "Another classic outing from the Brothers Gibb certain to trigger off a mighty sales explosion. Group's follow up to their number one 'How Can You Mend A Broken Heart' is likely to repeat their chart success and continue their string of top ten releases." Even Billboard raved, putting the new single in its Top 20 Pop Spotlight alongside "Imagine." It wrote, "The Gibbs follow their No. 1 million seller 'How Do You Mend a Broken Heart' with another powerful ballad performance loaded with the same sales and chart potency." It was nowhere near as big a hit as "How Can You Mend a Broken Heart," but it was still a Top 40 hit -- at least according to two of the three trade magazines. In Record World, "Don't Wanna Live Inside Myself" reached its highest peak, plateauing at #30 on November 20 and 27, 1971. In Cash Box, the song peaked at #39 the week ending November 20. 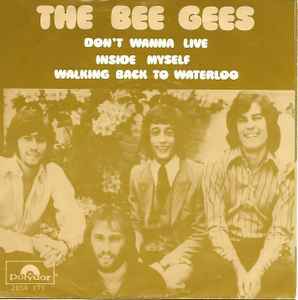 Meanwhile, as had been the case with most Bee Gees singles since 1969, Billboard ranked "Don't Wanna Live Inside Myself" much lower than the other two trade magazines, with a #53 peak on the November 20 Hot 100. "Don't Wanna Live Inside Myself" was a top-10 hit in several smaller markets, including Big Rapids, Michigan and Welch, West Virginia. It also made the top 20 at both WLS and WCFL in Chicago. But it wasn't an across-the-board national radio hit (it did little or nothing in New York, Los Angeles, or Philadelphia). There's no question that "Don't Wanna Live Inside Myself" was released no later than early October 1971, based on its appearance in the trade-paper reviews in the October 16 issues. The single was released as Atco 45-6847. "Don't Wanna Live Inside Myself" has the matrix number of 71C-22091, one smaller than the 22092 of "Country Woman," adding more credence to the hypothesis that Atco assigned many of these matrix numbers based on an early running order of Trafalgar. That, however, doesn't explain "Walking Back to Waterloo," which has a matrix number of 71C-22014. My best guess is that Atco received tapes of at least a couple of the Trafalgar cuts in advance of the primary reel. The U.S. stock 45s were pressed again at the usual four plants -- Specialty (SP), Plastic Products (PL), Monarch (MO), and Shelly (LY). In my searching, I saw only one version from each. -- The "the" is gone again, as the artist name is back to "Bee Gees". -- "Don't Wanna Live Inside Myself" is the full-length 5:25 version. -- Both sides are mono fold-downs. -- The A-side publishing is Casserole; the B-side is "Casserole, Warner-Tamerlane". -- For the first time, a P-date (P-in-a-circle) appears on the labels. In anticipation of the revised U.S. Copyright Act, which would become effective February 1, 1972, several labels jumped the gun and put ℗ 1971 on their labels late that year. In case you're wondering, the ℗ originally was short for "recording first published," as it was borrowed from UK records. Originally, British records stated "Recording first published (fill in the year)"; this was replaced by the symbol ℗ in 1965. The ℗, as opposed to the © copyright symbol, recognizes that the two aren't exactly the same. Today, the ℗ is usually said to stand for "phonorecord," as it is recordings that get the ℗ symbol. "MFG. BY ATLANTIC RECORDING CORP., 1841 BROADWAY, NEW YORK, N.Y."
From LY, it's "MFG. BY ATLANTIC RECORDING CORP., 1841 BROADWAY, NEW YORK, N.Y. 10023". -- The LY pressing, as usual, is missing the 45- prefix on the catalog number. SP: "Produced by Robert Stigwood and The Bee Gees"
PL: "Prod. by Robert Stigwood & The Bee Gees"
MO: "Prod. by Robert Stigwood and The Bee Gees"
LY: "Produced by Robert Stigwood & The Bee Gees"
Meanwhile, promo 45s exist from SP, PL, and MO. All promos contain "Don't Wanna Live Inside Myself" on both sides, one side mono white label, the other side stereo blue label. All copies feature a 3:50 "Short Version." (No promo I've seen contains the full-length album cut.) The matrix number is ST-71C-23088 on the stereo side (the ST- is omitted on the mono side). Finally, there is an advance promo from Specialty (SP) on plain white typeset labels with no label logos on them. These were sent to radio stations in key markets before regular promos were produced and are not test pressings. This advance promo is mono/stereo, 3:50 on both sides. Most interestingly, the title is listed as "I Don't Want to Live Inside Myself" on both sides. Someone can correct me if I'm wrong, but I don't think this 3:50 edit is available anywhere else. Why did they waste that great song on an obscure soundtrack??? They probably thought it was an old song not worth bothering about. Sounds like Barry had been listening to Donovan's "Colours" to me. See post #168 of this thread. The tune was well known enough before the "Melody Fair" movie came out that they probably felt that people would've questioned why the group would want to rehash something from the past to use as an A-side. Not really a fan of this track or its flip side. One of my favorite Bee Gees songs. Simple and beautiful. It has an innocence about it that I can't really explain. Always a concert highlight to me (especially when Maurice goofed off lol). To be honest, it took me a while to warm up to this track. I like it now, but it took me a while to get there. I actually much prefer the flip side, Walking Back to Waterloo. Trafalgar was not a bad album. It had some good songs on it. However, I personally rate 2 Years On over it. Castle in the air and cut to the chase like this. Is this the nadir of Bee Gees singles? The worst single released by them since they left for England? Don't Wanna Live Inside Myself is a plodding, aimless, boring, overly-long piece of dreck. It's telling that, after two huge hits, this song fizzled on the charts around the world. Even in New Zealand, where the band were big, this song didn't reach the charts. cut to the chase and sunspot42 like this. That's an excellent double-sided release in my books! In the Morning is a pretty good tune as well. Isn't that the one they re-recorded in the early '70s? Already mentioned in the thread? I actually prefer the '70s recording over the '60s, which is very rare. I've always liked "Don't Wanna Live Inside Myself" but it seems an odd choice for a single, especially since they didn't edit it down, time-wise. I would have preferred "Somebody Stop the Music" as a single instead. This was a really strange coupling with a song from Idea backed by one from Odessa ? One of the more interesting Gibb-related projects during the hiatus years was Maurice's work with a group called Tin Tin. 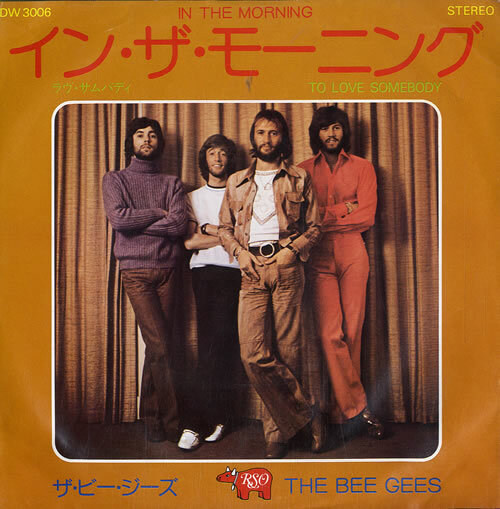 In the spring of 1971, many months after the 45 was released and even longer after it was recorded, the group had a Top 20 hit, "Toast and Marmalade for Tea," that sometimes is mistaken for a Bee Gees song. Perhaps its belated hit status, during the break between "Lonely Days" and "How Can You Mend a Broken Heart," is why Atco in the U.S. was in no hurry to release a new Bee Gees song. Tin Tin consisted primarily of two expat Australians, Steve Kipner and Steve Groves. Kipner, son of 1966 Bee Gees producer Nat Kipner, had been a member of the group Steve and the Board, with whom the Bee Gees did a song exchange in 1966 before the Gibbs left for England. In 1967, Kipner met Groves and formed a duo; they emigrated to England in 1968 and fell back into Maurice's and Barry's orbit in 1969. Tin Tin ended up signed with Robert Stigwood, and Maurice Gibb became their producer. Kipner, Groves, and Maurice Gibb started recording in 1969, after Robin had left the Bee Gees, but before Barry and Maurice split. The first result of this partnership was a single, "Only Ladies Play Croquet"/"He Wants to Be a Star," released in the UK in June 1969. Maurice is all over both sides of this 45, though all the vocals were by the two Steves. It seems to have been successful enough that Polydor wanted an entire Tin Tin LP. Sessions for the album continued in June 1969. Maurice didn't play on every track, but he produced everything. "Toast and Marmalade for Tea" was recorded at this time, with Maurice playing bass. "Maurice had broken his arm that day falling down a flight of stairs. He showed up with a cast on and shot full of painkillers, and he proceeded to take advantage of the open bar in the studio. The Steves were not happy with this listless song to begin with, and as the session deteriorated they eventually left. Maurice put on tape his best John Lennon vocal impression, and somehow played bass as well in his distinctive style. Billy Lawrie vaguely recalls that he might have been there too, but admits his memory of the late 1960s is none too good. "It would have remained one night’s foolishness if a mono mix of the tape had not found its way to release on the Beacon label in 1970, with the artist credited as The Fut. Maurice would say years later that he had no idea how that happened. The record appeared as early as 1970 on Beatles bootlegs as a rare Beatles recording. It did not help clarify things when Lenono Music, cleaning house in 1985, registered a copyright on it as a John Lennon composition. Evidently it was in John’s collection of Beatles bootlegs and someone once again thought it sounded like John. He had denied the song in his lifetime. At any rate, the song had already been registered in May 1974 (by someone reviewing tapes at RSO) as written by Kipner and Groves. The American licensing agency BMI lists it as by Kipner, Groves, and Lawrie." Recording for the Tin Tin LP continued through November; Maurice plays on some songs, but not on others. The resulting album, simply called Tin Tin, was released in February 1970 in the UK. In August 1970, sessions started for the second Tin Tin album, with Maurice once again producing. By this time, the group had become a four-piece, with Carl Groszman and Geoff Bridgford, two former members of Steve and the Board, joining Kipner and Graves. (Groszman, using the name "Carl Keats," had written "Lonely Winter" for the Bee Gees in 1966.) Three songs were recorded; only one of them would be released, and not on Tin Tin's second album, but as a stand-alone. With the Bee Gees' reunion that month, Maurice never again worked with Tin Tin. Groszman became a songwriter, and Bridgford became the Bee Gees' regular drummer. Tin Tin finished its second album with Billy Lawrie producing most of it and the two Steves producing the rest. On the resulting album, Astral Taxi, Maurice is credited as executive producer, but his direct role was limited. In the wake of the Bee Gees' reunion, Atco finally decided to release the Tin Tin debut album in the States in October 1970. "Toast and Marmalade for Tea" was issued in late November 1970 on Atco 45-6794, one number before "Lonely Days"; the date is based on a review appearing in the December 5 Billboard. At first, the song looked to be a big stiff, as it failed to chart upon release. Then, suddenly, in February 1971, "Toast and Marmalade for Tea" broke big in the Midwest, starting with Minneapolis-St. Paul, Minnesota and Omaha, Nebraska and spreading to Wichita, Kansas. By March, the song resided in all three trade magazine's sub-100 chart (Bubbling Under in Billboard, Looking Ahead in Cash Box, and Coming Up in Record World.) In early April, "Toast and Marmalade for Tea" was #1 in Waterloo, Iowa; by then, it had made the top 100 in the three trades and was breaking in the Northeast and West. Eventually, in late May, the song peaked at #15 in Record World, #16 in Cash Box, and #20 in Billboard. It also peaked at #6 on The M.O.R. Chart in Record World and #10 on the Billboard Easy Listening chart. Atco followed up "Toast and Marmalade for Tea" with "Is That the Way," which was released in July 1971 from Astral Taxi. It failed to catch on the way its predecessor had; it got only to #53 in Record World, #59 in Billboard, and #67 in Cash Box. On the lighter-sounds charts, it got to #33 on the Record World M.O.R. Chart and #36 on the Billboard Easy Listening list. "Set Sail for England," another track from Astral Taxi, was issued in late November 1971 on Atco 45-6853. Billboard reviewed the song in its November 27, 1971 issue. It may not exist except as a mono/stereo promo. To close the Tin Tin saga, a song Maurice did have a hand in, a 1970 outtake called "Talking Turkey," was issued as a stand-alone single in January 1973 on Polydor 15055, again possibly as a mono/stereo promo only. Hep Alien, Marley-purt-drive, cut to the chase and 1 other person like this. Hep Alien and Hadean75 like this. It may have been the end of the Tin Tin saga, but it was certainly not the last the world would hear of Steve Kipner, who went on to a rather successful songwriting career. You may have heard a song called "Physical", recorded by another Australian ex-pat. tim_neely and sunspot42 like this.